Weekend sports warriors take note - that pain radiating out of your elbow may be tennis elbow. But don't be so quick to ask your doctor for a cortisone shot. Research has shown cortisone, or corticosteroid shots, can alleviate the pain in the initial weeks, but have little effectiveness in the long run, and do nothing to reduce recurrence rates. Doctors have prescribed physical therapy, also known as physiotherapy, in conjunction with the shots, hoping to increase the cortisone's long-term effectiveness, but a new study in this week's Journal of the American Medical Association finds that the physical therapy doesn't aid the cortisone shots at all.It's contrary to what Bill Vicenzino, one of the authors of the study, expected. "I was surprised to find that addition of physiotherapy did not reduce the recurrence or lift the success rate in the long term." "We were also very surprised that the addition of steroid to physiotherapy tends to diminish the effectiveness of the physiotherapy," he said. 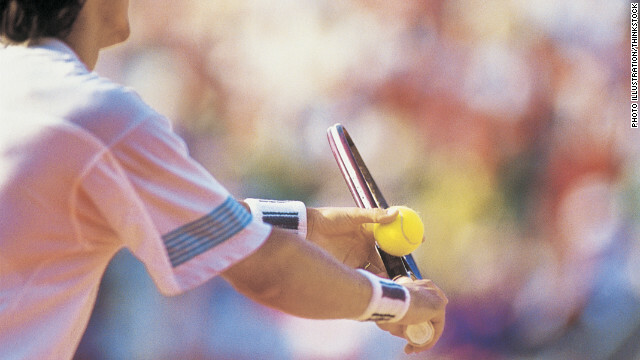 The study evaluated 165 patients who had pain from tennis elbow for more than six weeks. Patients were divided into four groups - one group given just cortisone shots, another group given placebo shots, a third group receiving both the steroid and the physical therapy, and a final group receiving a placebo shot and physical therapy. The study found that after a year, those who had the cortisone shots had the least successful outcomes and highest rates of recurrence. And the addition of physical therapy made little difference to the shots. However, physical therapy alone seems to provide the best outcome, with just under a 5% recurrence rate after a year. Almost half of all people who play racquet sports like tennis, squash, or racquetball have tennis elbow, but racquet sports aren't the only way to get it. Any sort of activity that requires a lot of twisting or gripping motion, like pulling weeds, using a screwdriver, or using a computer mouse can also inflame the tendon that connects your forearm muscles to your elbow. Dr. R. Amadeus Mason, who was not involved with the study, remarked that it has been standard practice for some time to use saline or lidocaine shots in place of cortisone. Mason is an assistant professor in the department of Orthopedics and Family Medicine at Emory University and advocates for physical therapy. "The recommendation has been don’t use steroid, use either saline and mechanical treatment, and going back to physical therapy as your first line," he said. But tennis elbow is just difficult to treat, he noted. "Yes, there are a lot of treatment entities, but when you go back and look, the treatment entities aren’t consistent across the boards." My chronic, low-grade tennis elbow flared into a major problem when I increased the intensity of my weight training too recklessly. Ultimately, I could barely lift a cup of coffee or brush my teeth. I saw an article in a major newspaper about a product called a Flexbar, which is used to treat the condition. The exercise was clearly explained on YouTube. I ordered a Flexbar and began doing the maneuver a few times a day. It strengthened the muscles that support the ligament, and my pain was completely gone within two or three weeks. I have avoided both drugs and physical therapy for several more major conditions by consulting rehab web sites and YouTube. Their instructions are excellent. The Flexbar is good, but I've got a product that I invented called Elbow Ease that you might want to try. It fits in your pocket, desk or pocket book. I invented it after my own tennis elbow wouldn't go away and I couldn't find anything to help me work out the right muscles, wraps were a waste of money. My site is http://www.elbowease.com/. Faulty technique must be corrected. Then the pain will abate. For a video of the proper backhand technique, watch any Richard Gasquet or Carla Suarez-Navarro video. This goes after the cause, rather than the result of bad technique. Hello, Neat post. There is a problem along with your website in internet explorer, may check this? IE still is the market leader and a huge portion of other people will miss your fantastic writing due to this problem. Tennis elbow is an overuse injury occurring in the lateral side of the elbow region, but more specifically it occurs at the common extensor tendon that originates from the lateral epicondyle. The acute pain that a person might feel occurs when they fully extend their arm.-,.."
We now have an uncomplicated approach for fixing your tennis elbow challenge having an quick remedy. We now have an uncomplicated method for correcting your tennis elbow trouble having an quick alternative. We have an uncomplicated process for repairing your tennis elbow issue having an uncomplicated alternative. We have a fairly easy method for fixing your tennis elbow difficulty having an straightforward solution.